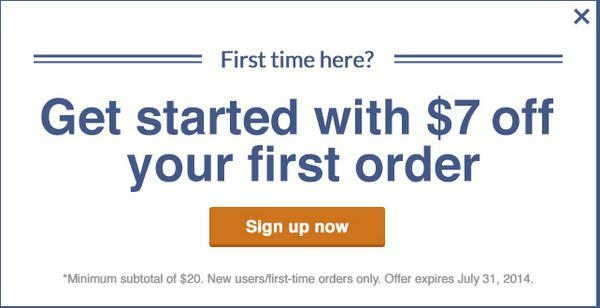 $5 Statement Credit for Spending $25 at Delivery.com & $7 for New Users! Via Deals We Like, you can get a $5 American Express statement credit after spending $25 with Delivery.com by August 3, 2014. You can get a $5 statement credit when you spend $25 at Delivery.com by August 3, 2014. Wine, liquor and tobacco purchases are excluded. Delivery.com is an online delivery service that partners with local restaurants, grocery stores, liquor stores, laundry, dry cleaning, and tailors. So if you’re lazy like me, and don’t want to drive, you can use Delivery.com to have food, groceries, alcohol, and your laundry delivered to you! You get the $5 statement credit for online purchases. Your order has to be delivered before August 3, 2014, to get the $25 statement credit. You can log into your American Express account to see if you were targeted for these offers. You will NOT see the same promotions on each site. So if you can’t find a specific offer on 1 site, check another site. What Can You Buy to Get the $5 Statement Credit? If your city isn’t served by Delivery.com, but you’ll be traveling to a city that is, you can buy a $25 Delivery.com gift card. So you could use Delivery.com to have something delivered to your hotel. However, you can NOT get the $5 statement credit if you buy wine, liquor or tobacco. The Delivery.com website states you can get laundry and groceries delivered but I mostly found restaurants. You could order from a liquor store in New York, but it wouldn’t qualify for the $5 statement credit. However, you could buy a $25 Delivery.com gift card and then use it to order from the liquor store! 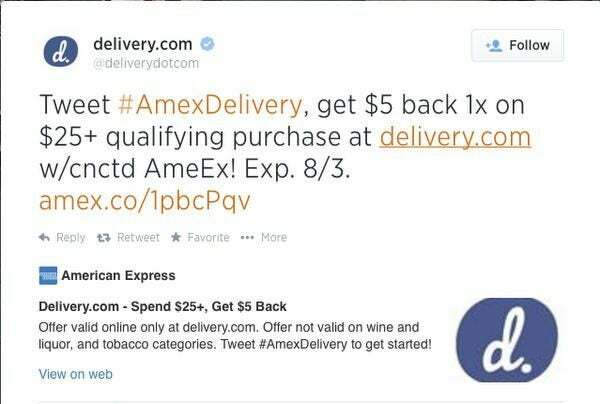 You can get a $5 AMEX statement credit after spending $25 at Delivery.com by August 3, 2014. I love these AMEX offers! The deals just keep coming. Some of the offers are targeted, like the $20 statement credit for spending $20 at Amazon and the $25 statement credit for spending $25 at Costco promotions. But others are available to everyone like the $25 statement credit for spending $250 at Best Buy promotion.